Fujifilm has announced at CES 2014, the XF 56mm F1.2 R, a fast ‘portrait’ lens for its X system mirrorless cameras. With an angle of view equivalent to an 85mm lens on 35 equivalent. It’s professional quality construction features internal focusing mechanism for fast & silent autofocus. The XF 56mm F1.2 R will be available in February, with a suggested retail price of $999.99 / £999.99. 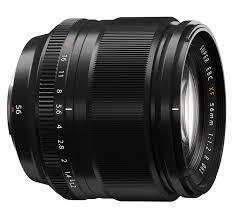 Fujifilm Corporation (President: Shigehiro Nakajima) has announced the release of the FUJINON XF56mm F1.2 R lens. Available from February 2014, this latest addition to the company’s line up of professional-grade lenses for X-series interchangeable-lens cameras features a fast maximum aperture of f/1.2, a focal length of 85mm*1 and delivers beautiful bokeh, making it particularly suitable for high quality portraits. The XF56mm F1.2 R is less than half the size of an equivalent lens on a full-frame camera*2 and offers fast, quiet autofocusing that ensures stress-free shooting for both the photographer and the model. It also delivers incredible resolving power for high quality results that are enhanced by the unique skin tone reproduction technology found in Fujifilm’s X-mount cameras. Using the XF56mm and selecting one of two PRO Negative modes from the Film Simulation menu on the camera body will ensure users can capture beautiful portraits with rich tonal gradations reminiscent of images from film cameras. Attach the XF56mm F1.2 lens to a body that supports the Lens Modulation Optimiser*3 and picture quality leaps even higher thanks to the automatic correction of diffraction when shooting at smaller apertures. The XF56mm F1.2 R combines an inner focus mechanism*4 and a DC coreless motor for rapid autofocusing speeds, which are boosted further when used with a X-series camera body that supports phase detection AF. The structure and positioning of the focusing unit reduces sound and vibration for silent operation and with no lens barrel movement during focusing, the structure effectively prevents dust particles from getting into the lens and degrading picture quality.